Two Beautiful Cuts in One Box! 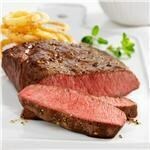 Six 6oz Filet Mignons- Perfectly Center Cut and Trimmed - Fork Tender! And Six 8oz Prime Flat Iron Steaks - Very Tender and Extremely Flavorful! With a fork, combine the butter and herbs. Form into a ball, wrap in waxed paper, and chill. Heat a stainless steel skillet until very hot but not smoking. Add oil. Sprinkle salt and pepper on both sides of the steaks. Place in the skillet and cook for 3 minutes per side for medium rare. Transfer filets to a cutting board. To the pan add shallots. Let cook for 1 minute, stirring. Add the red wine and let reduce until almost all the liquid has evaporated. Add the beef stock and let reduce by half. Stir in the fines herbes butter. Serve the filet mignon with the sauce.